This week we’ll talk about some of the challenges we face as developers. How do we make our fantasy game different from others? How do we make all of the game elements consistent and coherent? What features and platforms should we focus on? 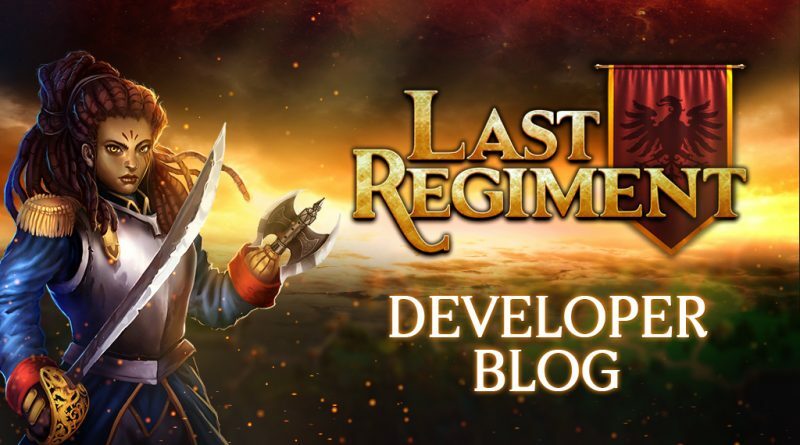 Before we share what we’ve been working on, we’d like to take a step back to discuss the lore of Last Regiment again. Some have been wondering why there are a variety of units and how they all go together, so we’ll start by going over the history of Kothia, where the game takes place. When we made Legends of Callasia, we were focused on creating a solid one to two hour multiplayer experience with simultanous turns and missed out on building the story. It was predominantly based on multiplayer, and won’t do well when you don’t have enough players, thus shortening the game’s lifespan. There is a cycle of a) needing a certain number of players to make the game fun, and b) if the game is fun, you’ll get more players. We eventually had many dedicated users, but it was not enough to power the game. For Last Regiment we knew we had to do something different in order to generate the audience. We realized that in LOC, there’s a silent minority who didn’t play multiplayer but instead played the single-player campaigns. This is where we should start: to build a world, set its foundation, and write the story. So the questions were: Where do we draw from? How do we get started? We needed to find a year, and usually, the characters, technology and culture in normal fantasy is based on the middle ages. But we did want to follow the typical stereotypes that every other game already has. We’re still sticking to the genre, because the team is good at beautiful fantasy art. So what if we changed where we pinned the history instead of moving away from fantasy? We decided to choose a much later period and a quite advanced year in history: 1772. There was more scientific development; there were trading companies, colonization, and nationalization. What if we had that history in a world where magic did exist? How would elves, orcs, and goblins deal with all these new technology, culture, and social structures? What do armies look like? What weapons would they use? In Last Regiment, we call this period The Reconquest. The world is composed of a number of continent, the biggeest one being Kothia, which is similar to the Roman Empire. There were massive wars that involved magic, summoned spirits, infected creatures, constructs , and more. There is a massive apocalypse and civilization is largely destroyed. Humans fled to the old world until centuries later when they decide to reconquer the continent with better technology and tools to fight back. This is the setting of the game. You as a player will have to go back and explore this new world. And so here’s what we have been working on in the past two weeks. We scrapped mana and decided to stick to only one type of resource for the game. We’ve been testing the concept of hard points, which does make the game more interesting and offers a lot more strategy, but we’re not yet happy with the actual types of structures you can build. We made so many art and animations for these buildings earlier and we’re not sure where to use it. We built the assets too fast and some of them don’t make sense anymore, so we’ll have to revisit them. We tweaked some of the data and rebalanced some of the units. Making them have higher HP made a positive difference in the game: they now last long enough, but are more expensive and take longer to build. You as a player would now spend more time trying to keep your units alive, instead of churning them out and letting them die endlessly. You have to learn to manage units better, and this accelerated the pace of the game. We changed how the fog of war works, revised the visual presentation of effects, and continued fixing some of the art and user interface. And some other bug fixes! One of the things that makes a polished game look really polished is artistic coherence. It’s the developers willingness to stop and make it something that it needs to be. For example, we have reasonably good art for the hero Tristan, but it looks visually different from the rest of the art in the game, such as the Chainsaw Shocktrooper (aka elf with the chainsaw). We can’t have both art that are aesthetically different from each other, and this is an expensive decision to make. This is one of the realities of game development: there’s always going to be something that comes up that you didn’t expect that you have to come back to and have it redone. Even if it doesn’t affect the gameplay, the extra level of polish makes a difference. Multiple screen support is something you don’t usually think about. When developing games, you must keep in mind that changing resolutions could cause the user interface to be misaligned. There are two things you have to look at: the scale (bigger or smaller) and the ratio (widescreen, etc.). You need to go through each of the different elements of the user interface and decide where you want them aligned – to the center or on the edges of the screen. What if some players want the elements in the same size? What about retina size? Meanwhile, there’s the concept of supporting the game on multiple platforms. There are features that are desktop-specific and tablet-specific. There are things on the PC such as hotkeys and mouseover highlights which are not available on a tablet, which is touchscreen. You need to focus down on your audience in order to know which platform-specific features to address. For Last Regiment, we’ve decided to make it PC-centric. As mentioned earlier, another thing we’d like to focus on is the single player campaign. We had players in Legends of Callasia that were vocal about wanting everything immediately unlocked when they get the game, instead of having to play the campaigns to unlock more content. This created a created knock on effect. What’s the point of single player now? Suddenly it became meaningless, and this is a mistake we want to avoid in Last Regiment. There is pleasure in working hard to unlock something, and the sense of completion is compelling for most players.